PORTIS, DAVID Y. (ca. 1813–1883). 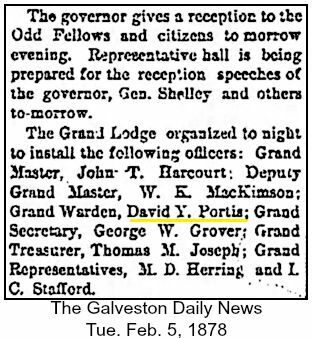 David Portis, attorney and public official, was born around 1813 in North Carolina and probably moved to Texas after the Texas Revolution. He practiced law with John W. Portis in Houston in 1839 and in 1840 or 1841 moved to Austin County. He replaced James H. Kuykendall, who had resigned, as representative from Austin County in the House of the called session of the Sixth Congress in 1842 and was reelected to the Seventh Congress. On December 28, 1843, he married Rebecca Cumings, daughter of the Rebekah Cumings who was one of Stephen F. Austin’s Old Three Hundred colonists. In January 1845 Portis was chairman of an annexation meeting at San Felipe. He represented the Seventeenth District, comprising Austin, Colorado, Fort Bend, Lavaca, and Wharton counties, in the Senate of the Third Legislature, 1849–50, and in 1853 served as a delegate to the state Democratic party convention at Washington-on-the-Brazos. The United States Census of 1860 listed Portis as owning seventeen slaves and over 35,000 acres with real property valued at $100,000 and personal property valued at $20,000. He represented Austin County in the Secession Convention of 1861. 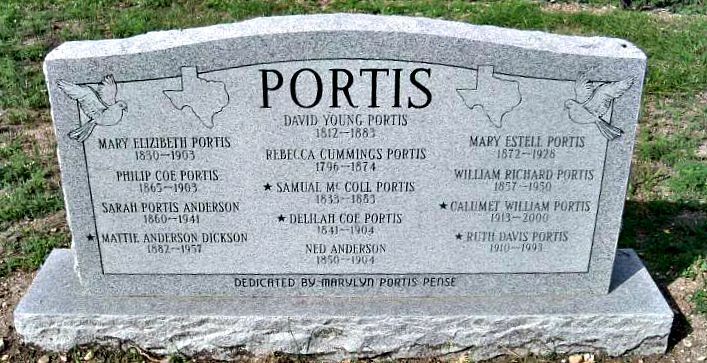 Portis seems to have lived the remainder of his life in Austin County and to have died there in February 1883. This is a new gravesite marker for the relatives of David Y Portis, in the Odd Fellows Cemetery in San Antonio, TX. The cemetery records indicate that his wife Rebecca and a few others are buried in this plot — but not David.